No celebrity is safe from the ever-vigilant paparazzi who thrive on exposing personal aspects of their lives. This week’s victim is Oklahoma City Thunder forward Kevin Durant, who was caught with some medical marijuana outside of a club in Hollywood. Here’s what happened. No celebrity is safe from the ever-vigilant paparazzi who thrive on exposing personal aspects of their lives. This week’s victim is Oklahoma City Thunder forward Kevin Durant, who was outside the nightclub “Hooray Henry’s” in Hollywood, California when the paparazzi swarmed him with video cameras. TMZ discusses this occurrence in the segment below, during which they dismiss Durant’s extracurricular habits as a big deal—especially considering Durant’s injury. Regardless, this footage may be worrisome for Durant’s athletic career. Injuries in professional athletics are common-place: each year the sporting world will lose a few rising stars to devastating injuries that require years of physical therapy and powerful prescription medication. 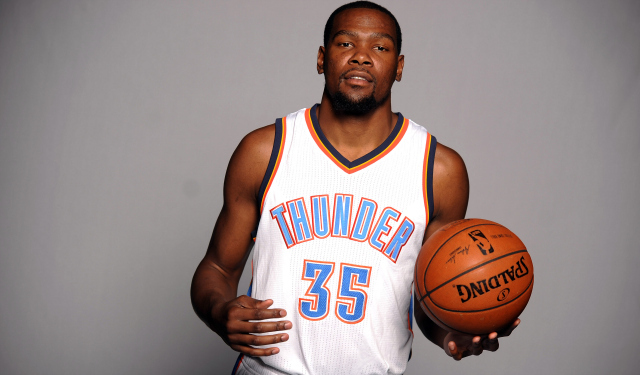 On March 31, Durant underwent bone graft surgery after leaving a game on February 22nd against the Mavericks. Durant has yet to return to the game of basketball despite stating that he is doing just fine. While Durant has been injured, the league does not test him for cannabis use, nor do they test other players outside the regular season. Interviews with NBA players suggest that marijuana use among players ranges from 50-80 percent despite developments for cannabis testing in 1999. The same interview states that it is hard to fail a marijuana test in the NBA and that you have to be stupid or dependent to fail. Numbers like these leave holes in the plotline of cannabis use in the NBA, suggesting that marijuana is actually common and that players have simply found workarounds in the drug tests. However, is the pattern unique to basketball? Allen St. Pierre, the executive director of the National Organization for the Reform of Marijuana Law (NORML), spoke on the greater issue of cannabis in sports. He stated, “it’s kind of a social contract, when they (players) sign these huge contracts, they agree to all kinds of behavior they’re not gonna do, largely not to embarrass the team.” What St. Pierre is suggesting is that despite his six-time NBA all-star status, multiple M.V.P. awards, sponsorships and charity work, the fact that Durant smokes cannabis harms the brand of Oklahoma City Thunder. What? In 2015, the idea that an athlete is prohibited to use a non-performance-enhancing drug with proven medicinal value while playing a sport in a country where five states have full recreational cannabis allowance is absurd. The NBA should really consider the liberties of the players who make them millions of dollars. For example, the National Hockey League (NHL) does not prohibit marijuana use among players—instead, the levels of drugs in athletes systems are monitored so irregular patterns can be identified and dealt with professionally. This system isn’t perfect, but it allows adult players the liberty to decide what goes into their body, without the shaming of the NHL community.